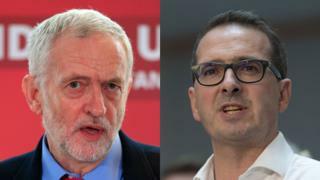 Labour has received more than 180,000 applications to vote in the party's upcoming leadership election over the past 48 hours, it has said. Some 183,541 people paid £25 to become registered supporters and qualify for a vote in the contest between existing leader Jeremy Corbyn and Owen Smith. Mr Smith was nominated by 162 Labour MPs. The party ruled last week that Mr Corbyn did not need to get nominations. The winner of the contest is due to be announced on 24 September. Laura Kuenssberg: Can Owen Smith do it? Later on Wednesday, Mr Corbyn told supporters his campaign would focus on economic policies. Speaking to an audience in central London, he said he was not going to "get in the gutter" with anybody during the campaign, insisting he wanted a discussion about the "kind of world we want to live in". He said he wanted to see people come together to challenge housing shortages, the inadequacy of public services, and to give people "hope and inspiration". The new registered supporters will vote alongside more than 380,000 party members who joined before 12 January and members of affiliated unions. The 48-hour period for people to sign up as a registered Labour Party supporters closed at 17:00 BST, when the deadline for contenders in the election also passed. A spokesman for Mr Corbyn said it was "reasonable to assume" that the majority of the new registrations come from supporters of the Labour leader. By the deadline, MP for Pontypridd Mr Smith had secured the nominations of more than 70% of the party's representation in the House of Commons - as well as 10 MEPs. Among his nominators were former rival Angela Eagle, who withdrew from the race on Tuesday, and ex-leader Ed Miliband. Mr Corbyn did not require the backing of Labour MPs to get on the ballot paper, following a ruling by the party's National Executive Committee earlier this month. Who can vote in Labour leadership contest? Labour Party members, affiliated trade union supporters and so-called registered supporters are able to vote, although there are some key differences from the 2015 contest which Jeremy Corbyn won. Labour Party members need to have signed up on or before 12 January to be eligible to vote. Nearly 130,000 people have become members alone since the EU referendum. They will not be able to vote unless they also pay to become a registered supporter. Earlier on Wednesday, Mr Smith said if he won the election he would offer Mr Corbyn the role of party president. He said his rival was "not a leader", saying Mr Corbyn had "sloganised" on austerity without setting out what he would do instead. He said Labour would split if Mr Corbyn was re-elected, saying he had personally warned the leader the party was "teetering on the brink of extinction". The former shadow work and pensions secretary also described as "nonsense" criticism of him over the NHS, based on comments made while working for pharmaceutical company Pfizer. Unnamed allies of Mr Corbyn in the Times seized upon the 2005 remarks that choice in the NHS was a "good thing".